50% of energy consumption in office buildings is related to air conditioning. 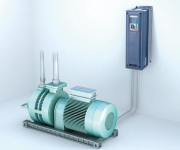 The FRENIC HVAC series is the dedicated inverter for HVAC that features functions and performances offer the optimal thermal environment for the people working in the building by keeping the energy consumption in various devices (compressor, condenser water pump, AHU and others) to the minimum. Fuji Electric contributes largely to global environment by realizing carbon dioxide reduction with energy saving by the inverter. Model can be selected from two model types. The first slim body design among the Fuji Electric inverters. The size is the same between IP21 and IP55(the first in the industry). The inverter can be installed independently; no control panel is required.